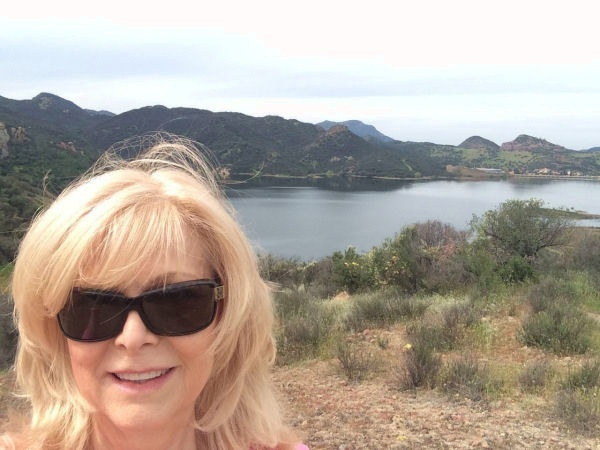 As I stepped outside my Westlake Village home, planning to rush off to the gym. The hills caught my eye. They were rich with spring color and they seemed to be inviting me to come and play. 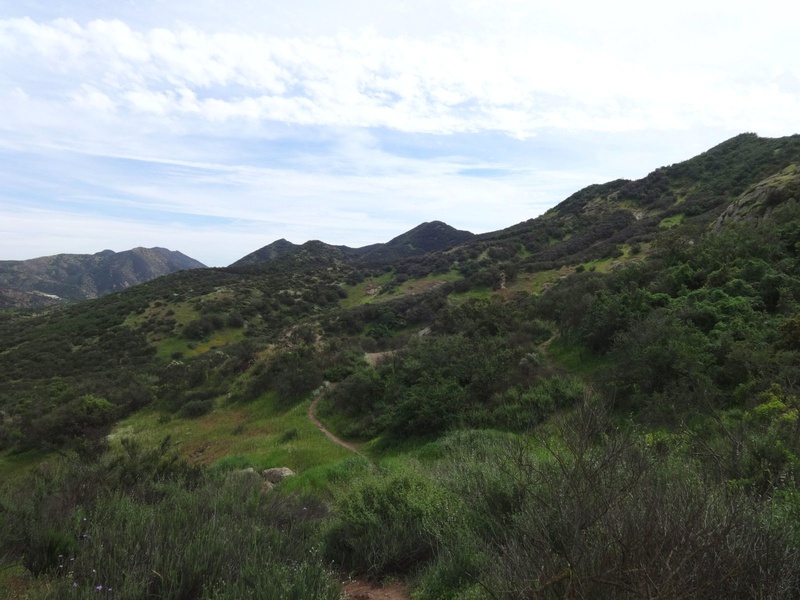 March is usually the greenest month in Southern California and with the abundance of local trails available to explore, it would be a shame not to sample one or two. 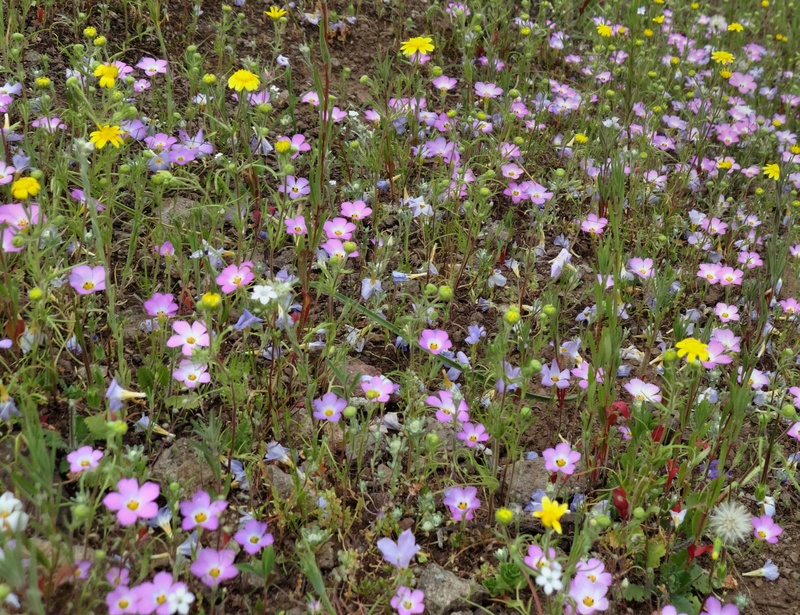 I decided to skip the gym and headed to the Westlake Vista Trail in the hope of seeing some seasonal wild flowers. 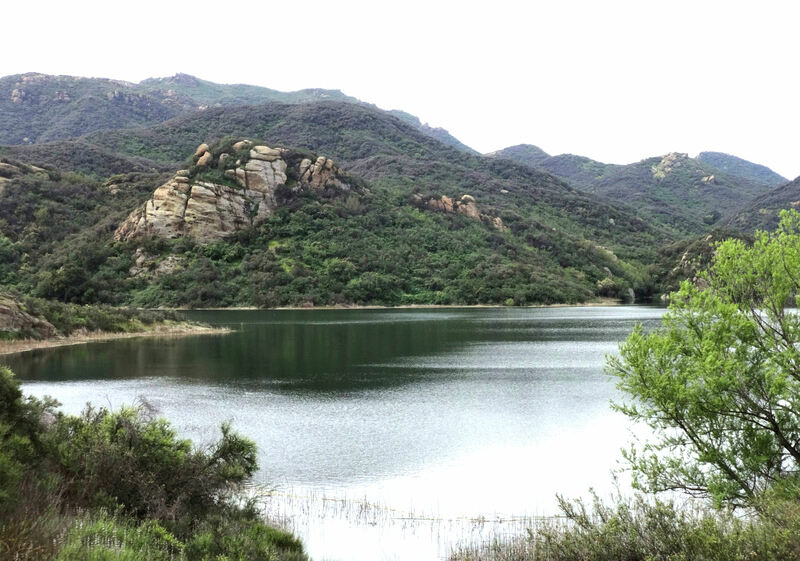 The trail starts at Triunfo Canyon, just off Lindero Canyon Road at the Pentachaeta Trail. You will stay to the right for Westlake Vista. 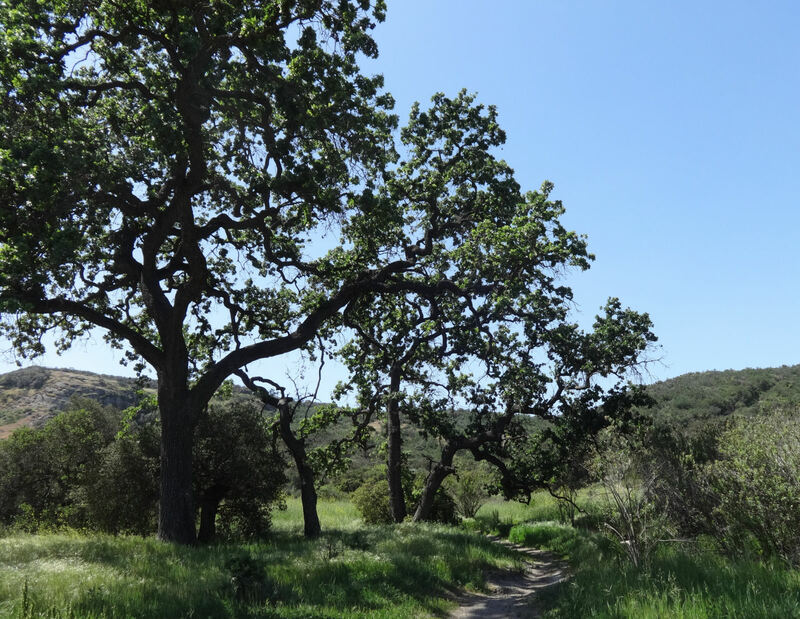 Just around the bend of the trail head is a grove of natural Oak trees, a meadow and then a fork in the path. 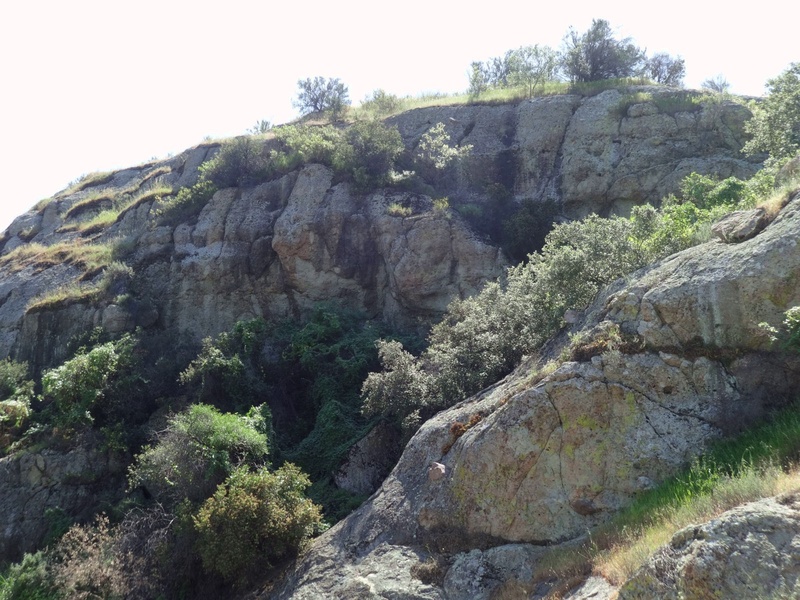 Both paths lead to the reservoir but I took the left trail which quickly rises to view rocky cliffs. I was drawn toward the rocks to get a better look. There was a small trail off to the left but when I saw how narrow and steep it was, I quickly return to the main trail and soon arrived at the reservoir. It’s a fairly easy hike for a healthy person but there are some loose rocks that make the steep sections of the trail very slippery. It took about 25 – 30 minutes to get up there. 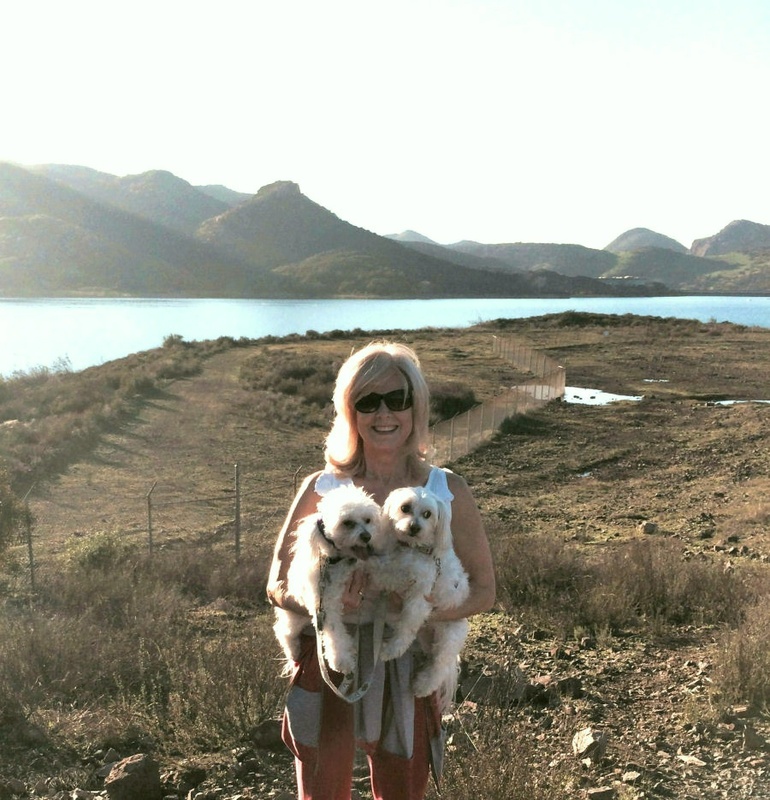 I probably could have made it in faster time but I was accompanied by my two Maltese. To the right I could see what looked like a vast open flood plain. 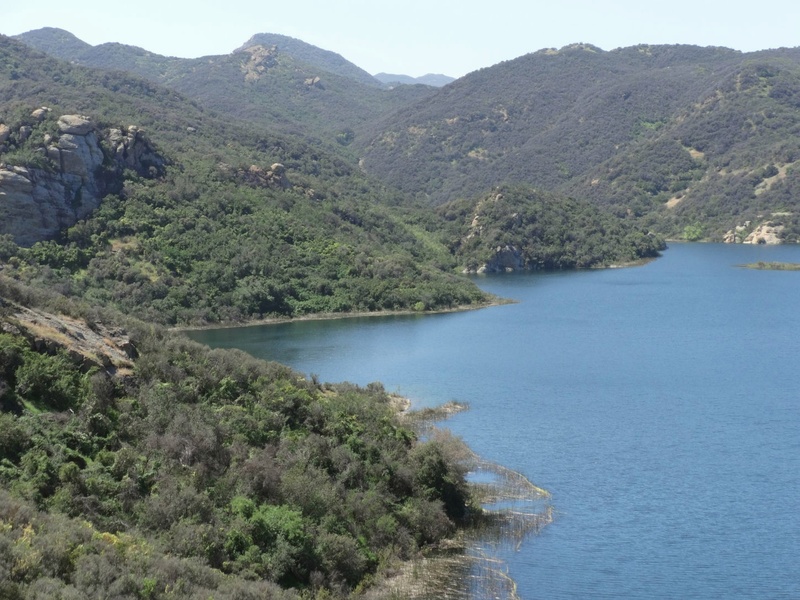 To the left was the crystal clear reservoir framed by rolling hills and mountains. We met a couple of other hikers up there and one of them offered to take a photo of me and my cute furry boys. It seemed that I was already at the top of the trail. It was lovely; but exploring further, I discovered another small trail to my left. I hadn’t seen it the first time I ventured to the reservoir. The path brought me up to a view of the water that exposed a grander aspect of it’s liquid expanse. Higher and higher we climbed to another stunning vantage point as the captivating sounds of water birds echoed in the distance. It was at this point that I felt like I was in another world, instead of the city of Westlake Village. It was as if I was at a destination vacation in the mountains but I only went around the corner to experience this magnificent view. At the top, viewing the wide stretch of the regal hills, my ambitions were abandoned. There was only that moment, the clean air and the warm sun. The plans from this morning now belonged to the past. The present is filled with God’s love for me and the gift of His glorious creation. 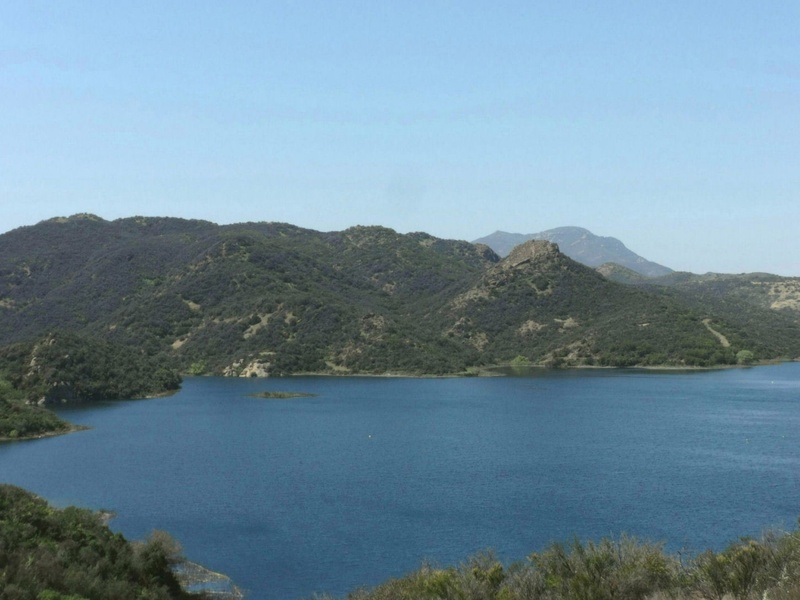 The Westlake Reservoir is an oasis hidden high in the hills. Taking it all in was like water for my soul. It remains natural and untainted. It’s not accessible by car and can only be enjoyed after climbing the mountain. But it’s here, so close to my home, waiting for it’s majesty and beauty to be discovered and enjoyed. The view on the way down was also out of this world. 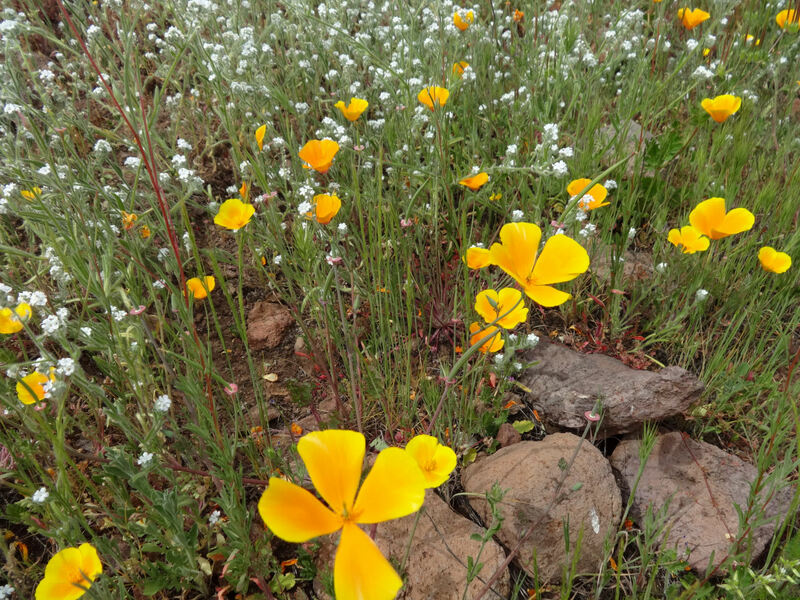 And there they were, the wildflowers I was hoping for, my reward. Their colors graced the gentle slopes calling me to dance and sing before their Maker. So beautiful, but only here for such a short time. My message is simple. There is always gratitude and beauty in every season of life, even in the trials and tribulations. My husband Steven and I are focused on caring for his dad and his wife, who are quickly declining from dementia. It’s difficult to experience this with them. When we come to these hard moments in life, we find hidden strength in ourselves. We nourish our souls and receive refreshment in friends and in nature. We will all have to give an account of our lives, what we have been, and done. To give our parents companionship and joy in their advance senior years, is an enormous thing to them right now. 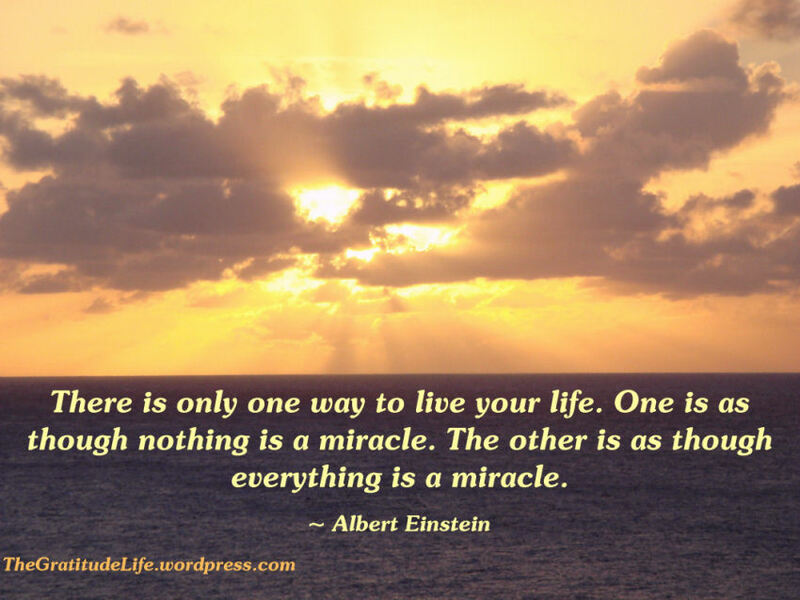 Every lucid moment they have is a small miracle for which we are very grateful.